Geometric abstract landscape based on a black grid against a grey background, with squares of yellow, blue, green and red. William Gear was born in Scotland in 1915. By aged seventeen he was studying at the Edinburgh College of Art, he then spent two years at Edinburgh University Fine Art Class from age twenty to twenty-one. In 1937 he won a travelling scholarship to study under Fernand Léger in Paris at the Academie Colarossi. Within this period, Gear experimented with Cubism and began to develop his own stylistic characteristics such as the heavy black lines that border bold areas of colour. 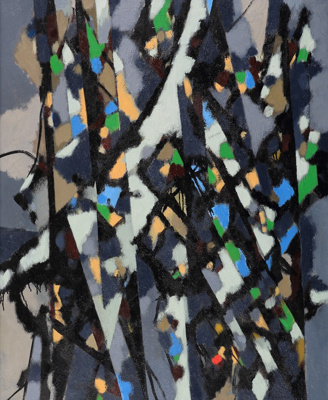 Gear's best known works are those post-World War II, a time when he was concerned primarily with abstraction. In 1951 Gear received a commission from the British Arts Council, for which he produced 'Autumn Landscape'. This painting received the prestigious Festival of Britain Purchase Prize. The awarding of this prize to an abstract painting was a scandal in London at the time. One year later, Lady Mabel Annesley, then a Trustee of the Bishop Suter Art Gallery, purchased 'March Landscape' 1952, and other works for the Gallery while on a trip to England. However, the Suter Trust Board had issues with her selections, rejected three works and questioned the Gear. Annesley resigned in protest to their reaction. When 'March Landscape' went on display for the first time at The Suter, a public debate about the merits of abstract art erupted in the 'Nelson Evening Mail' in December 1952, so much so that this was reported in England. This served to confirm Gear's reputation as being one of the most avant-garde painters of his day. The painting was renamed 'Spring Landscape' by the Suter Trustees and was influential on New Zealand artists; possibly inspiring Colin McCahon (such as his 'Titirangi Kauri' paintings from 1953) and most certainly Irvine Major, whose 1967 exhibition 'Nelson in Abstract Form' owed much to this work. March Landscape is very similar to a Gear painting from February 1952, called 'Early Spring, 1952'.